I'm back into Mad Scientist cooking again. You see I've been rightsizing my recipes. I'm counting calories since I have no "off switch" around certain foods, especially baked goods. So if it says that a serving is 200 calories, I tend to make it just a little bit smaller and call it done. I made four cupcakes today from a mix. The box said that 1/3 cup of mix would be 200 calories. 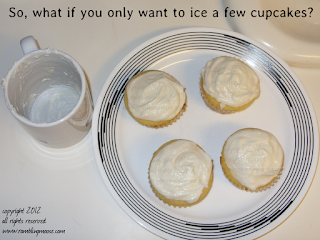 So therefore multiply by three and divide by four and you get four perfect 150 calorie cupcakes. Of course they needed to be iced. 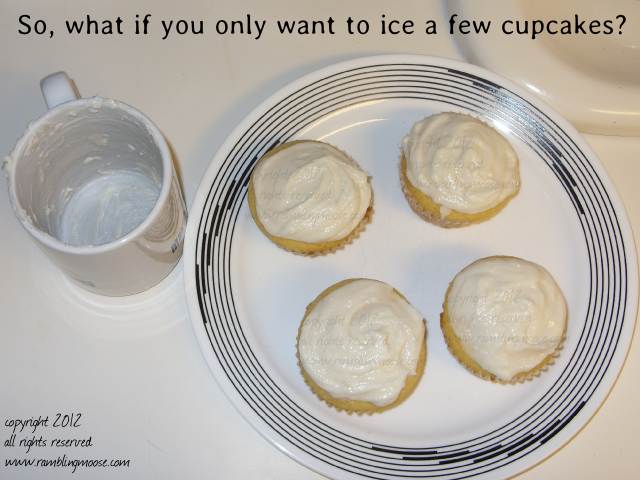 I have a foolproof icing recipe that unfortunately makes way more icing than you want to use at one sitting, or 1/2 the amount of icing you need for a cake. Surf the internet and see if I can find a simple recipe I can downsize. All ingredients were done by weight - 1 ounce is 28 grams, 1/2 ounce is 14 grams. Yes, I did use grams but you don't have to it seemed fairly forgiving but add the milk in "drips and drabs" so you don't get a runny icing. It's all about the "texture"! If it looks right, it's done. Add all ingredients to a large-ish coffee mug. Mix with a regular fork until smooth. Use as icing, but chill in refrigerator. That's it. It's all a bit Frankenstein's Cake Monster, but the results were tasty. You don't have to cut yourself off from good things, just be moderate with them. Each of those cupcakes were 250 calories a piece. It helps that I'm eating 2200 calories a day of course. If you're not at that level, just act accordingly... so enjoy! I know I did... the icing was excellent, one of the best recipes I have ever stumbled across.